Our Navajo Spirit online boutique is dedicated to promoting and preserving the significance and symbolism which is represented in our Navajo Southwest Clothing. While modern western culture tends to select clothing, colors, and styles which our own eyes are drawn to, or which flatter us, the Navajo Nation has always taken their designs beyond aesthetics and into the spiritual realm where nature and culture meet. When you purchase apparel, jewelry, or accessories from Navajo Spirit, you are choosing colors and patterns which have distinct energetic meanings. The oral history of significant symbols and colors, which has always been a part of Navajo culture, is expertly preserved and passed down by our award-winning fashion designer, Virginia Yazzie-Ballenger, and our talented Navajo staff. Blue - symbolizes the south and the mid-day sun because the bluest cloud-free skies can usually be viewed towards the south. Blue is also representative of the feminine. Black - symbolizes the north, night, or dark, because the clouds or storms usually approach from the north. Black is also representative of the masculine. White - symbolizes the east, dawn, and new beginnings because the white light of dawn emerges from the east. Yellow - symbolizes the west, or the sunset, as the yellow sun always sets to the west. Red - Use of the color red pays a subtle compliment to the earth. There are also common symbols which you will see incorporated into our Navajo Southwest clothing. The list of symbols and figures common to Navajo culture is extensive. We invite you to learn more about the Navajo culture and the significance behind colors and symbols. When you choose to purchase a particular piece of Southwest Navajo clothing or jewelry, you are inviting the essence of Navajo Spirit into your life. 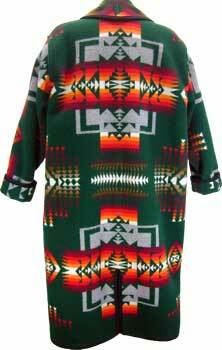 Click any of the links below to browse our selection of Native American clothing online. We carry a variety of clothing items for both him and her, and many of our items are 100% one-of-a-kind. Please do not hesitate to contact us if you have questions while shopping in our store: we are glad to help.